As the bad guys and threats get tougher and meaner, so does Batman's crime fighting gear! He's come a long way from just a pair of spandex and a cape. He's tinkered in the Batcave with Alfred to create some high-tech power armor that can take on any super powered foe. So, of course, his simple cowl needed a bit of an upgrade. As such, we've had to keep up with Bruce in the costuming world, which is why we have this new Batman mask! 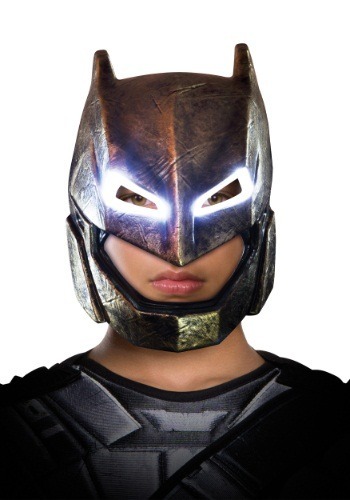 Straight from Zack Snyder's Batman v Superman movie, this Dawn of Justice Light-Up Armored Batman Mask brings you the look of the Dark Knight's heavily armored helmet. With metallic paint and light up details in the eyes, this costume mask looks fierce enough to make even Superman think twice before starting a fight with you! Once you combine this with a cape and some Kryptonite weapons, you'll be all set, even the Man of Steel DOES decide to starts something with you!